Letters from the President of the Wharton Club of New York. Our Joseph Wharton Dinner commemorated the one-year anniversary of the Club passing the baton of leadership from Kenny Beck, WG’87, to an experienced volunteer team, which I am just a part of. Kenny commented at the Dinner that the transition has been so smooth that he has not received one comment or complaint! I am so grateful to each and every member on our Board of Directors, Executive Committee and committees of volunteers for making the transition a success and for growing the Club in new ways! Prior to the Dinner, I reached out to past award recipients and learned that most had at least three mentors who really helped them in their careers. If you don’t have any mentors, think proactively of who you would like as a mentor and consider reaching out to them. L.D. Salmanson, WG’13, in the previous issue of this magazine wrote about how he used that strategy successfully. One of this year’s awardees featured in this issue has had over three significant mentors — Kunal Bahl, W’06, Eng’06, Co-Founder and CEO of Snapdeal, who received the 2018 Joseph Wharton Award for Young Leadership. During the Dinner, I asked alumni who are in the position to Make the Call to consider reaching out and mentoring those who you believe have potential to contribute to the C-suite or on a Board. If you attended this year’s Dinner, you would have heard from several such remarkable alumni. As you can see from the articles in this issue, these alumni are making global, national and local impact. The recipient of the Lifetime Achievement award, Arthur D. Collins, Jr., WG’73, is retired Chairman and CEO of Medtronic, and board member of Boeing, Alcoa and U.S.Bancorp. Art felt called to lead as a young man entering the Navy and learned early that, to lead, he needed to earn trust by performing consistently with integrity. Jonathan Gray, C’92, W’92, President and COO of Blackstone, is the recipient of the 2018 Joseph Wharton Award for Leadership. Jonathan took an unusual path of having worked solely at Blackstone since graduation, and then from an early stage, grew Blackstone’s real estate portfolio to $120 billion today! The 2018 Joseph Wharton Award for Social Impact went to Anne Welsh McNulty, WG’79, President of the McNulty Foundation. Anne met her husband in high school and attended Wharton with him. From an early age, they believed that leadership could be learned, practiced and improved to make a positive impact on others. Soumyo Chakraborty, WG’01, is our Club’s modest but accomplished Chief Technology Officer. Soumyo serves as a VP of Technology for Two Sigma, one of the most successful hedge funds in the world. Read about Soumyo’s thoughts on using technology to improve collaboration among Club volunteers, help alumni create webinars for fellow alumni, and provide online access to some of our most popular events. When I came to the United States from Singapore as an international student, I was excited to attend the Wharton School. It was not originally my intention to stay after graduation to make a life in this country. Nevertheless, I thought it would be a good experience to interview for jobs here, to practice and learn from the process. Ultimately, I landed a position that even my parents (who wanted me to return home) told me to seize. Plus, I met my husband, Jason Jaslow W’95 EAS’95. The rest, as the adage goes, is history. The alumni featured in this issue remind me that Wharton continues to attract and welcome the best from around the world, no matter their origin. These stories show immigrants who strongly desire to contribute to our society and advance their lives. captured these amazing alumni stories. Anju Marempudi, WG’05, got his idea for EventVestor during his first day in class. He shares about providing alternate datasets to hedge funds, creating WCNY’s Fintech Affinity Group, and helping his home state in India develop blockchain. L.D. Salmanson, WG’13, from Israel, created Cherre, which provides millions of data points to the commercial real estate industry. L.D. had absolute clarity about what he wanted to achieve at Wharton and did. Edrizio De La Cruz, WG’11, of Arcus, expresses the enthusiasm and grit of someone who came as a boy from the Dominican Republic, and went from mechanic to Wharton and then to successful fintech founder. Sara Yoon, W’12, founder of Pop Up Nation, has a passion to help small retailers gain a foothold in the market, remembering her Korean parents who started out selling electronic gadgets on a table in downtown Newark, New Jersey. Kaihan Krippendorff, Eng’94, W’94, with a German mindset, created his firm Outthinker, 14 years ago, to guide Fortune 500 companies in helping their own intrapreneurs collaborate and innovate. Solomon Liou, WG’10, founder of KidPass, combined lessons from Wharton and his Taiwanese parents, to go directly to his future customers to understand their needs. Tony Andreoli, W’97, used his connections as VP of WCNY Business Networking and Business Development meetups, to co-found a blockchain company, Tribeca Workshop. Alexandra Bonetti, W’07, founder of Talent Hack, talks about how she was inspired to help staff health clubs. Alexandra’s sadness that the Venezuela of her youth no longer exists calls to mind the challenges that many alumni rise from. I hope to see you at this year’s Joseph Wharton Awards Dinner on October 11. Seriously, if you attend, please introduce yourself to me. It’s also a great place to connect with our Club’s leadership and volunteers where most will be in attendance. 2018 Joseph Wharton Award for Young Leadership: Kunal Bahl, W’06, Eng’06, Co-Founder and CEO of Snapdeal. It is different. Standing on the stage during the Joseph Wharton Awards Dinner, addressing more than 200 Wharton alumni, including business icons, the School leadership and friends, is definitely different from sitting in the audience as I’ve done for over 10 years. As the new Club President looking out at our volunteers and esteemed guests, I had a surprising thought, “Wow, I’m not feeling nervous at all! I know exactly what I am setting out to do for our alumni community, and I’m simply here to tell them why I’m so fired up about the opportunity to make an impact for all of us.” And when you’re an actively involved participant in the Wharton Club of New York, it is a fuller experience than being an alum who happens to work and live in this region. As you read this issue, consider getting involved, even in a tiny way, such as participating in a Club activity each quarter. This issue highlights those who have stepped up in our alumni community, and invites you to do the same. Three areas of the Club are highlighted in this issue. The Volunteer Services division, led by Jordan Halperin, W’98, is the face of the Club. He and his team put on volunteer nights, send out volunteer “job” descriptions and answer your questions! Roe Bonelli, WG’99, has led the Finance division for years. She corrected the Club’s course early on, and has since stewarded our investments to attain a current balance of over $1.3 million. Rob Dinerman, W’78, our passionate new VP of Marketing and Communications, is creating a team of experienced and new volunteers to manage our social media, website, videos, magazine and more. Rob is leading this team to discover what alumni value in the Club today and tomorrow. If there is one thing in common across the latest cohort of Joseph Wharton Awardees who spoke at our annual gathering, it is that they all stepped up in life. James Riepe, W’65, WG’67, former Vice Chairman of T. Rowe Price, received the Joseph Wharton Award for Lifetime Achievement. Seeking an opportunity where he could learn more, Jim left the public accounting industry and stepped up to join a young investment team that led to helping Jack Bogle co-found Vanguard. Victoria Mars, WG’84, former Chairman of Mars, received the Joseph Wharton Award for Leadership. Victoria stepped up as a young woman to get involved in her family company and develop the first ombudsman office there. Jesse Pujji, W’06, C’06, Co-Founder and CEO of Ampush, and Nick Shah, W’06, Co-Founder and COO of Ampush, received the Young Leadership Award. As high schoolers, they stepped up to attend a summer camp at Wharton, where they became friends and eventually founded a company together. Here is to you stepping up in your life and work! Have you ever looked at the variety of industries listed in the Wharton Alumni Directory? Wharton alumni impact the world in many walks of life! As your new President of the Wharton Club of New York (WCNY), I envision the Club providing you valuable resources that positively impact you and what you do professionally or personally, no matter your class year. And I hope you will consider positively supporting your fellow alumni through the Club’s many offerings. Normally each magazine highlights those offerings, whether it be the Joseph Wharton Dinner, our multitude of career development services, our many affinity groups in the CFO, entrepreneur, hedge fund, investment, real estate, and retail arenas; our Speaker Series, social outings, business development groups, and more! This issue however, commemorates the recent history of the Club (from 1995) and the current leadership transition. Even as alumni of the number one business school in the world, you know that it is not easy to start or to grow a successful business. The odds are against you. The same is true for an organization. Many alumni clubs struggle, even falter, as WCNY had at one time. There are many factors that make a club thrive, and you read about those factors in this issue. I recently heard from the School’s alumni office that other clubs are always looking to learn how WCNY is organized. Some may think that part of our success formula is our large base which offers a pool of volunteers and active participants at events. However, WCNY has learned – the hard way – that size alone does not enable a club to succeed. Rather, the quality of dedicated team-focused volunteers sharing the vision, possessing integrity and fiscal discipline, offering their commitment of time, and fulfilling their deliverables in a timely manner are the building blocks of a successful club. It’s important to note that it takes many (hundreds! ), to make WCNY successful. And often the positive results of alumni efforts aren’t seen until years later. So, I want to stress that WCNY is grateful for all those who contributed their time, effort, and funds since the Club’s founding, in 1962! In this issue we asked a few volunteers, in the Club to represent all of you. Nigel Edelshain, WG’93, shares his perspective as Chairman of WCNY since 2003 (through June 2017) and of course, how Kenny Beck, WG’87, dramatically changed WCNY. Dana Michael, W’82, talks about his time since joining the board in 1996, and the Board nomination process. Allen Levinson, W’77, WG’78, explains how the Club progressed in the late 1990s and how the Joseph Wharton Dinner started-up again. Tom Courtney, WG’90, explains how the Club was re-built in the mid-1990s. And I share my thoughts on our path forward. When we consider the challenges in the world around us, we are fortunate to count alumni among our friends and associates, because they are capable and intelligent, and they continually uplift themselves and their surroundings. People like you! WG’81, won the Joseph Wharton Award for Leadership. After serving in a number of high-level positions, Ken founded Moelis & Company, a premier financial advisory firm, to create an entrepreneurial, intellectually driven culture. Ken serves on the School’s Board of Overseers, and definitely “takes the call,” often hiring Wharton alumni. We gave the prestigious Joseph Wharton Award for Lifetime Achievement to Howard S. Marks, W’67 — Co-Founder and Co-Chairman of Oaktree Capital Management, the largest distressed-debt investor in the world, with $100 billion under management. Howard wisely managed the University’s endowment from 2000 to 2008, helping Penn avoid Harvard’s huge losses during that time. Thanks to our Joseph Wharton Awards Committee for their talent and work in orchestrating what Alex Gorsky, WG’96, Chairman of Johnson & Johnson, called a “spectacular event.” The committee is headed by Arthur Bass, W’73, and includes Andrew Brenner, C’78, W’78, WG’79, Dan Ho, W’81, Gerald Lucas, WG’87, and Vinay Pande, WG’85. And it was wonderful to have Andy McMaster, WG’76, Vice Chairman of Deloitte, as our Dinner Chair. In this issue, read about Dr. David Fajgenbaum, Penn Med’13, WG’15. He inspires and harnesses the smarts of Wharton students and alumni to cure diseases, including his own rare disease, iMCD. I hope that many of you come to our hundreds of events held in New York. Every week, there is something going on. Our VP of Programming, Jennifer Gregoriou, W’78, and her team bring in amazing speakers, including 10 Wharton professors in 2015 (read about it here). Artist alumni, rejoice! Neil Blumstein, W’78, Tricia Taitt, W’00, and Jill Krutick, W’84 have stepped up to create the affinity group, the Wharton Arts Network (WhAN). Join them to promote freelancers and entrepreneurs across multiple artistic disciplines! Listening is an essential skill in this social economy. It’s also an old fashioned skill, as practiced by Dean Geoffrey Garrett, on his Wharton Global Conversations Tour stop in New York. It was symbolic of the kind of listening he wants to pursue with alumni year-round. This issue highlights how WCNY continues the Wharton tradition of listening to your needs and providing amazing value. Be part of it! WCNY listened to alumni investors who wanted a high-powered affinity group to facilitate camaraderie, learning, and yes, investing! The Wharton Alumni Angel Network, WAAN, has surpassed expectations with educational events, three pitch nights, and eight investments. This resource was created through the substantial efforts of operating committee members: Deb Bardhan, WG’11, Corey Luskin, WG’94, Lesley Stroll, W’80, Amy Pan, WG’12, Michelle Fan, W’13; along with a steering committee of prominent investors. The Wharton Real Estate Investment Group, led by Celina Kuoch, WG’98, Nick Petkoff, WG’02, Eric Bashford, WG’88, host high profile events for that important sector. Read here about their most recent event – Technology Companies That Are Changing the Face of Real Estate. The President’s Forum brings top influencers to an intimate setting, allowing you (if you sign up on time) to meet them and discuss topical issues. Read how Gerard Baker, Editor-in-Chief of The Wall Street Journal, shared how his organization is winning in a tough industry. It is reassuring to have Bill Haddad, W’89, on the WCNY Board of Directors. His intelligence, knowledge of all things legal, good cheer, and his involvement in WAAN, as a Steering Committee member, are truly appreciated by the Club. Speaking of lawyers, WCNY has a new affinity group, the Wharton Legal Network. Lew Tesser, W’74, has assembled a leadership team and held an initial meeting. Read up, if you are in the legal sector, and would like to be involved! Lastly we look at three local alumni making things happen. Two entrepreneurs, Caroline Strzalka, C’00, WG’05 of itsbyu.com and Carmen Feliciano, WG’11 of Penny and Mary, are helping brides: one with do-it-yourself floral arrangements, and the other with worry-free planning. Linda Habgood, WG’98, a director at Delphos International, works out of New York, to provide public funding to major projects in emerging markets. Wharton is forever. Getting a degree from the top business school in the world is only the beginning. If you do not take full advantage of this amazing community for the rest of your lives, you’re not maximizing the return on the investment you made, to get that degree. Wharton stays in our bios forever and as such we have a responsibly to each other and to the school to protect the brand… it is in our enlightened self-interest to do so. I was reminded of all this at our recent Joseph Wharton Awards Dinner, which continues to amaze me. Terry McGraw, WG’76, the Joseph Wharton Leadership Award recipient in 2006, and this year’s Event Chair, spoke about the passion that Wharton alumni possess. The new dean, Geoffrey Garrett, marveled at the two anvils in his office, which belonged to Joseph Wharton. He said they reminded him that Wharton alumni “do not rest on their laurels”. Our five honored alumni honored this year, never gave resting a thought. Robert Crandall, WG’60, Former Chairman, American Airlines, who received the Joseph Wharton Award for Lifetime Achievement, encouraged all to get involved and join the public dialogue by which we settle the great issues of our time. Alex Gorsky, WG’96, Chairman and CEO of Johnson & Johnson, received the Joseph Wharton Award for Leadership. He spoke about Joseph Wharton’s values based charter when creating the school, and J&J”s charter as well. Our Joseph Wharton Award for Social Impact honoree, Durreen Shahnaz, WG’95, Founder and Chairperson of Impact Investment Exchange Asia (IIX) and Shujog, implored those gathered to help her grow the first social stock exchange. Neil Blumenthal, WG’10, and David Gilboa, WG’10, GEN’10, Co-Founders and Co-CEOs of Warby Parker, who were covered extensively in our Spring 2014, issue, received Joseph Wharton Award for Young Leadership. They spoke about the energy and dynamism of what is being built at Wharton today. Our volunteers don’t rest on their laurels either. Hundreds of events are being created by other volunteers. Two recent highly regarded events showcased Professor David Bell and Professor Stewart Friedman. A key member of the club featured in this issue is Vishal Gupta, WG’08, our Affinity Groups Chair. He explains how you can get involved in an affinity group, or possibly create a new one. Be inspired by these alumni and do not forget: “Take the Call”! Benjamin Franklin and Joseph Wharton were both pioneering entrepreneurs. They would be pleased to see the growing number of alumni transforming themselves into the newest generation of entrepreneurs. WCNY knows that the startup journey is an arduous one and supports that journey in the New York region. This Fall issue showcases the enthusiastic vision and successes of six local thriving entrepreneurs, and one working to break into the market. Four of the founders interviewed participate in the WCNY affinity group, Wharton Entrepreneurs-Education and Resource Network (WE-EARN): Joe Myer, WG’97, of ExecThread; Rajeev Jeyakumar, WG’13, of SkillBridge; Melissa Shin Mash, WG’12, of Dagne Dover, and Mark Hirsch, W’88, of Creative Worx. WE-EARN, led by Ross Klenoff, W’94, C94, offers educational, networking, and brainstorming events. Jake Schwartz, WG’08, co-founder of the rapidly growing teaching company, General Assembly, matches their training to companies’ needs. Broadway producer and cofounder of Musicians on Call, Vivek Tiwary, W’95, spoke at a Club Speaker Series on “Can’t Buy Me Love: The Business of the Beatles”. He shared his insights on creativity, how to invest in the theatre, building a nonprofit at the beginning of your career, and his new book, The Fifth Beatle. We love to profile those who truly invest themselves in the Club and broader alumni community. Jay Bakhru, WG’04, brings years of experience in the education sector to driving the Wharton Education Network, (WhEN). He is actively recruiting affinity group members interested in this essential part of our economy. Arthur Bass, W’73 was key to getting the first Joseph Wharton Dinner resurrected and in maintaining its tradition of excellence by ensuring that each year’s Joseph Wharton Award honorees are elected by all past honorees. And yes, our Dinner is coming up this October 2nd. We hope you will come and support the club, meet your peers and meet the honorees: Robert Crandall, WG’60, Former Chairman, American Airlines, will receive the Joseph Wharton Award for Lifetime Achievement; Alex Gorsky, WG’96, Chairman and CEO of Johnson & Johnson will receive the Joseph Wharton Award for Leadership; Durreen Shahnaz, WG’95, Founder and Chairperson of Impact Investment Exchange Asia (IIX) and Shujog will receive the Joseph Wharton Award for Social Impact; and Neil Blumenthal, WG’10, and David Gilboa, WG’10, GEN’10, Co-Founders and Co-CEOs of Warby Parker, will receive the Joseph Wharton Award for Young Leadership! Be inspired by these alumni and “Take the Call”! Spring in New York is always welcome! So are shoppers, who power up to 70% of the economy. How could they not? Retailers make the experience so inviting, exciting and convenient! They provide the right selection, merchandised perfectly, priced appropriately. Retail is an art and for decades, brand name retailers have been built, managed, researched, developed, scaled — led by New York Wharton alumni. Jay Baker, W’56, from a small shop in Flushing, developed the nation’s number two department store, and created a retail center at Wharton. Neil Blumenthal, WG’10 and Dave Gilboa, WG’10, GEN’10, worked after classes each day at Wharton to found the hottest retail concept in New York, Warby Parker. Brendan Hoffman, C’90, WG’97, third generation Wharton alum, led the ‘His and Her’ catalog at Nieman Marcus, and Lord & Taylor, before taking on the Bon-Ton Stores. Roger Farah, W’75, a retailer’s retailer, after leading at Saks Fifth Avenue, Footlocker, and Macy’s, turned around and grew Ralph Lauren calmly and remarkably to new heights. James Cohen, W’80, joined his father right out of school, to develop six hundred Hudson News stores, at train stations and airports, first in New York and then nationwide. The world comes to New York to shop for good reason! These six alumni were all helped by mentors, family, and fellow Wharton alumni. WCNY is here to lend you a hand through four initiatives: Our new Leads Councils focus on bringing alumni together to network and bring each other business. Meet our Leads Council coordinator, Melissa Amaya, W’03. Udayan Chattopadhyay, WG’01, tells what you can do to help him bring club and University closer together. Two ample resources already here in Manhattan are Wharton Career Services and Lifelong Learning. Learn here how their valuable and timely services can work for you! Then you can “Take the Call” and help your fellow alumni. Happy Holidays from the Wharton Club of New York! We have much to be grateful for in 2013, especially knowing and working with each other as alumni. From school, from that entire experience, we each take a little bit with us, and we are each successful in our way. Each one of us is Wharton, and in various combinations we are even more so. Today it’s popular to say you are your brand, well, you are also the Wharton brand. So while I sincerely hope you could Take the Call at least once during this year, I also hope that you told someone that you went to Wharton. When we promote Wharton, we protect it, and thus we promote each other and ourselves. 2013 was a momentous year for the WCNY. The Joseph Wharton Awards Dinner honoring four spectacular leaders, highlighted that momentum. Ronald O. Perelman, W’64, WG’66, is an inspiration and friend to many, including this club. We were honored to grant him the Joseph Wharton Award for Lifetime Leadership. Jacob Wallenberg, W’80, WG’81, continues to challenge his companies and family foundation, making a major contribution to Swedish society, and thus we awarded him the Joseph Wharton Award for Leadership. Brett Hurt, WG’99, delivered a powerful testimony of his transformation at Wharton. Brett founded three successful firms while still at Wharton, and more since graduating. He received the Joseph Wharton Award for Young Leadership. D. Wayne Silby, W’70, received the Joseph Wharton Award for Social Impact. He credits Wharton for the education that helped him initiate a $3.4 trillion impact in the finance industry. We were all honored by the presence of Dinner Chair, Al Shoemaker, W’60, Hon’95, and former honorees Ivanka Trump, W’04, Robert S. Kapito,W’79, William Mack, W’61, David Nash, WG’86, Dean Robertson, who is retiring, and our club’s very first president, Paul Paulson, WG’59. The future of the WCNY looks … brilliant! We know because our Club hosted two welcome receptions for 167 newly admitted New York-based graduate students to the Wharton School. As part of their decision making process, the new admits wanted to meet alumni. By the number of those who enrolled, our club helped the school reach new applicant enrollment records! Whether the world they graduate into is more fraught with risk or not, depends in part on the work of five alumni who understand, assess, monitor, and mitigate risk. In this issue’s interviews, Alan Levinson, W’77, WG’78, teaches about the power of securitization; Dana Michael, W’80, explains how to manage a firms’ internal risk; Humberto Salomon, W’97, tells how the world of risk management has changed since 2008; Neerav K. Agrawal, ENG’03, W’03, describes risks of hedge fund financing, and Steve Wiggins, WG’08, shares about building and selling risk models. Through our series on club history, we just learned that the Wharton Graduate Business School Club of New York was founded way back in 1962, by Paul Paulson, WG’59! Paul, who is still active in business, tells of their motives and success, 51 years ago! And today, Jeannette Chang, W’08, Chair for the WCNY Special & Social Events Committee, creates fun and unique social events for all alumni. Join in! The Joseph Wharton Awards Dinner is on October 3rd, and tickets are already in short supply. Be sure to sign up early! The bond among Wharton alumni amazes even me! If you do not feel the connection you are not doing one of two things: taking the call (which you knew I was going to say) or reaching out. Remember, nobody can take the call if you do not reach out! This issue shares stories of alumni reaching out over the years. Jon Huntsman, W’59, H’96 writing a letter (and our singing Happy Birthday) to Al Shoemaker, W’60 at this year’s Joseph Wharton Awards Dinner. Brian Roberts, W’81, CEO of Comcast, reaching out to future graduates to participate in the growth of his company. Now, WCNY is reaching out to you with our new WCNY Alumni Gift Discount program, featuring Sokol Artworks, Menaji, Living Room SoHo, So Smart and more creative Wharton-led companies, with wonderful gifts for the Holidays! Most importantly, the Wharton Alumni Network continues to be your most powerful tool for business, social, career and intellectual growth. Use it! Take the Call! Imagine the pressure on an Olympic relay racer, to not drop the baton and to not slow down. Three of the Joseph Wharton Award recipients this October 4th, can relate to these pressures and regale listeners with their own tales of empire passing. Leonard A. Lauder, W’54, Chairman Emeritus of the Estée Lauder Companies, who will receive the 2012 Joseph Wharton Award for Lifetime Achievement, took on the reins from his esteemed mother, Estée, and substantially expanded the business she created. Brian L. Roberts, W’81, Chairman & CEO, Comcast Corporation, who will receive the 2012 Joseph Wharton Award for Leadership, learned from his entrepreneurial father, Ralph J. Roberts, W’41, Hon’05, the 2009 recipient of the Joseph Wharton Award for Lifetime Achievement. And Ivanka Trump, W’04, Executive Vice President Development & Acquisitions, The Trump Organization, who will receive the 2012 Joseph Wharton Award for Young Leadership, grew up learning from the one and only, Donald J Trump, W’68. Rounding out this illustrious group is David B. Nash, WG’86, Dean, Jefferson School of Population Health, who will receive the 2012 Joseph Wharton Award for Social Impact for his systems approach to disease management. The summer’s issue focuses on significant contributions of our alumni to nonprofit foundations far beyond the New York region. Our own Diana Davenport, WG’87, WCNY VP of Volunteer Services, participates in leadership roles at the Commonwealth Fund, and other New York organizations. John Bernstein, C’82, WG’87, President of the Leon Levy Foundation, (and coincidentally Diana’s husband), helps to support everything from neural research to botanical gardens. Ed Feulner, WG’64, President of the Heritage Foundation, has consistently grown this influential think tank over a career of 35 years. Dr. Risa Lavizzo-Mourey, WG’86, CEO of the Robert Wood Johnson Foundation, one of Forbes magazine’s 100 most powerful women, was a pioneer health policy researcher at Wharton, and Sylvan Eisman Professor of Medicine and Health Care Systems professor at Penn. Our series continues on the history of the Wharton Club of NY, with the recollections of Rick Carmichael, WG’69, club president in 1980. Each of the past WCNY presidents laid the foundation for our success today. However, the success of the WCNY is only a small reflection of the much greater successes of our members. In a new section, Alumni Notes, we share the recent accomplishments of several alumni from the accounting, consumer goods, fashtech, and pedestrian navigation industries. Let us know about what is happening in your career and we will try to include it in future Notes. Finally please read the Take the Call postings on the inside back cover and visit (www.whartonny.com/forum.html) for the latest postings, and to post your own! Remember Wharton Alumni help, hire, invest in, and buy from Wharton Alumni; if a fellow alumnus calls … you know what to do! It is this enlightened self-interest that is the ultimate power of the Wharton community. The Wharton Alumni Network continues to be your most powerful tool for business, social, career and intellectual growth. Use it! Take the Call! No matter how busy things get at the WCNY, I love working on the Joseph Wharton Awards Dinner. By honoring four alumni each year we celebrate the breath and depth of the Wharton Alumni Community, which is quite amazing. Attending the dinner is a great opportunity to hear and meet these successful people in a private setting offered to no one other than Wharton alumni. The Wharton Club of New York began in earnest in 1971 thanks to a confident, young graduate, Bob Bedell, W’68, and an enthusiastic team of volunteers. We are chronicling the history of the club in a series of articles beginning in this issue. Be sure to let us know what you know about the club’s history, as this series continues. Carl E. Rosen, WG’77, recognizes Wharton alumni’s abundant capacity to make a difference. Carl wrote about an event held by the Club’s Career Development Division on how to get placed on a nonprofit board and why you should want to. Two key volunteers, who helped the club so much in past years, continue to propel it forward in their new positions. Regina Jaslow, W’97, and Jennifer Gregoriou, W’78, share their thoughts on their hopes for the club. Speaking of involvement, you may wish to become a Contributing Member of the Club. Please read about the benefits of becoming a Contributing Member and how to register. On a personal note, my good friend and the honorary chair of the 2011 Joseph Wharton Awards Dinner, William P. Carey, W’53, passed away in December. The JWD was his last public appearance. What a great man, friend and alumnus. Finally, you know I am going to tell you: Take the Call! Review the postings on the inside back cover and visit this hyperlink, www.whartonny.com/forum.html, to post your own! Remember Wharton Alumni help, hire, invest in, and buy from Wharton Alumni; and if a fellow alumnus calls…you take the call! It is this enlightened self-interest that is the ultimate power of the Wharton community. The Wharton Alumni network continues to be your most powerful tool for business, social, career and intellectual growth. Use it! Take the Call! This May graduates walked across the stage to receive their diploma and applause from their family and friends. When they descended from the stage they became alumni of the Wharton School of Business, and if they live in this area, members of the Wharton Club of New York. I hope that they and you take advantage of this significant asset that you have earned with your degree! Wharton alumni are everywhere. The WCNY enables you to connect with your fellow alumni in many walks of life. In this issue you can learn about those working in the publishing and media industries, or in entrepreneurial start-ups. You can also read about them on our website. We delayed our publication of this issue to be able to report on the Wharton Club of New York’s Alumni Business Showcase, perhaps one of the best examples of alumni TAKING THE CALL. The program which started as a business plan competition three years ago has grown beyond our wildest dreams. In this year’s program 72 judges evaluated submissions made by 63 teams – all Wharton alumni. Moreover when the program fully rolls out we are confident that thousands of accredited investors will be exposed to these 63 new businesses. I am proud to say that the Alumni Business Showcase committee, over 85 volunteers including judges, is our club’s largest committee and I would like to thank each and every one of them. They have truly taken our vision and have turned it into a reality. This issue focuses on the publishing and media industry, which is facing tumultuous times. Multiple perspectives are provided to the reader. Ellen Desmarais, WG’02, a rising executive at Dow Jones, brings us up to date on how a news operation turns challenges into opportunities. Alberto Vitale, WG’59, the former CEO of Random House, informs us about the essence of publishing, David Steinberger, WG’91, as CEO of Perseus Books, and shares his perspective as one serving a growing assemblage of independent publishers. Our own Peter Hildick-Smith, WG’81, and WCNY Vice President of Marketing and Communications, helps book publishers make sense of it all. It seems that more alumni are choosing the entrepreneurial lifestyle. Mary Beth Minton. WG’82 tells the story of her adventure with Zylie the Bear, and how the WCNY helped make it possible. That is actually a theme common to all of these interviews, that at Wharton they learned, became inspired, made friends, and set a course for their life. Facebook has been in the news as a new conduit for business. But how does it work? Read what alumni found out at this club event organized by Robin Colner, WG’83. As always, don’t forget to TAKE THE CALL. Go to this hyperlink, (www.whartonny.com/forum.html) to review the postings from your fellow alumni and please post your own! Remember Wharton Alumni should help, hire, invest in, and buy from Wharton Alumni; and if a fellow alumnus calls … you take the call! It is this enlightened self-interest that is the ultimate power of the Wharton community. What an advantage in these uncertain times! You are automatically a member of the Wharton Club of New York by virtue of the fact that you graduated from Wharton and live in this area. Take advantage of this significant asset that you have earned with your degree! The WCNY enables you to engage with fellow alumni working in capital formation, entrepreneurial endeavors and hedge funds; connect with fellow alumni in your field; and interact with other leaders who, like you, are more than happy to share their thoughts, ideas and resources with fellow alumni. You can learn more about each of these areas in the pages of this newsletter and on our website, www.whartonny.com. This issue begins by presenting the exceptional winners and judges from our 2nd Annual Wharton Alumni Business Plan Competition. The WCNY presented $10,000 to the winner, along with in-kind services from our sponsors. Thank you, volunteers and judges! 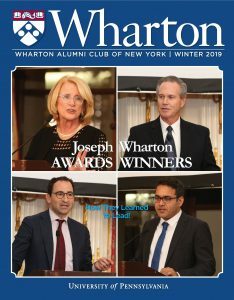 Our next article anticipates the 25th Annual Joseph Wharton Awards Dinner, with two excellent in-depth interviews of Dave Power, W’59, recipient of the Joseph Wharton Award for Lifetime Achievement, and of Farhad Mohit, WG’96, recipient of the Joseph Wharton Award for Young Leadership. This event has been the place to meet the best and brightest of Wharton since the revival five years ago and sells out early. BUY YOUR TICKETS NOW. One of our popular Speaker Series, presented by the Wharton Entrepreneurial Education and Resource Network, focused on how venture capitalists perceive start-ups and what is the best way to engage them. Who knew that, hidden in our alumni ranks, are top executives of the National Basketball Association? These three interviews reveal how our alumni contribute to one of the top brands in the world! The next article highlights the Wharton Hedge Fund Network. Superb speakers share their insights with the WHFN attendees about three times per year. The organizers are to be congratulated for showing the way for a successful affinity group to run. The law can be used by you, for you or against you, as is demonstrated in this comprehensive report on Wharton Professor Robert Borghese’s talk to WEEARN group members. This contains highly useful content on how to avoid pitfalls in leaving your employer to start your own company. The final article details how the Club’s exciting new Wharton Investment Network is gaining traction. Whether you are an investor, or a young firm seeking investors, be sure to read this! Please see Page 23 on becoming a dues-paying member. All alumni are basic members of the WCNY, but those who pay dues have access to even more (and helps us pay the bills)! As always, don’t forget to TAKE THE CALL (www.whartonny.com/forum.html). Go to this hyperlink, review the postings from your fellow alumni and please post your own! It’s easy. The secret to our continued collective success is: Wharton Alumni should buy from Wharton Alumni; Wharton Alumni should hire Wharton Alumni; Wharton Alumni should help Wharton Alumni; and if a fellow alum calls … you take the call! It is this enlightened self-interest that is the ultimate power of the Wharton community.